Home / Israel / Middle East / Palestine / Video. / Zionism / Watch: Jewish illegal settlers in west bank attacking Palestinian family in Hebron - Palestine and injured one of their kids. Watch: Jewish illegal settlers in west bank attacking Palestinian family in Hebron - Palestine and injured one of their kids. 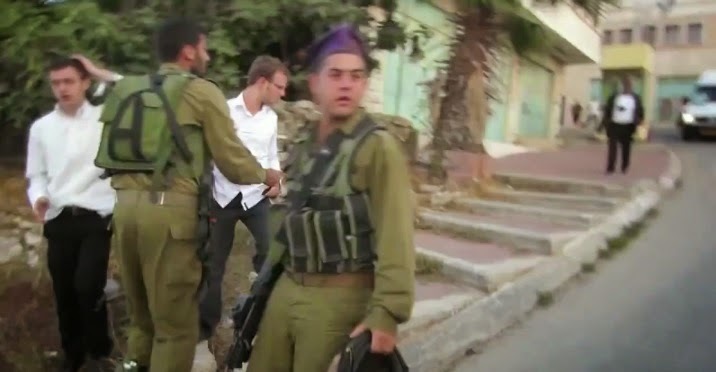 The video was taken in 23 - Sep - 2013 and it shows Jewish settlers who were attacking a Palestinian family who asked them to stay away from their house and the video shows how the Israeli soldiers didn't attack the Palestinian family or shoot them due to a coincidence for a convoy of tourists who were passing by, where usually in this case the Israeli soldiers would attack the family and most of the time would end up killing a member of the family at least. #شاهد .. مستوطنون يعتدون على عائلة فلسطينية في الخليل ويصيبون نجلهم بجراح ..الكشف عن فيديو تم تصويره بتاريخ 23 أيلول 2013 .. ويوضح اعتداء مستوطنين صهاينة على عائلة فلسطينية طلبت منهم الابتعاد عن منزلهم .. ويظهر في الفيديو امتناع جنود العدو عن ضرب أفراد العائلة الفلسطينية أو إطلاق النار عليهم بسبب تصادف وجود وفد سياحي غربي وأجانب في المكان.